Family outings might just be the best part of summer — you’re probably busy planning trips to an amusement park or the beach. And while even the littlest travelers should be protected from the sun, you may be surprised to learn that when it comes to sunscreen for babies, you should wait to apply it until they reach 6 months of age. So, how can you protect your newborn baby without sunscreen? For more, visit the Children’s Hospital of Pittsburgh of UPMC website. Sunscreen is a must for older children and adults of all ages. The U.S. Food and Drug Administration, however, recommends holding off on sunscreen for your baby until they are 6 months old. Newborn skin is still maturing and may absorb more sunscreen chemicals than is healthy. Instead, avoid sun exposure by keeping your baby in the shade and dressed in protective clothing. 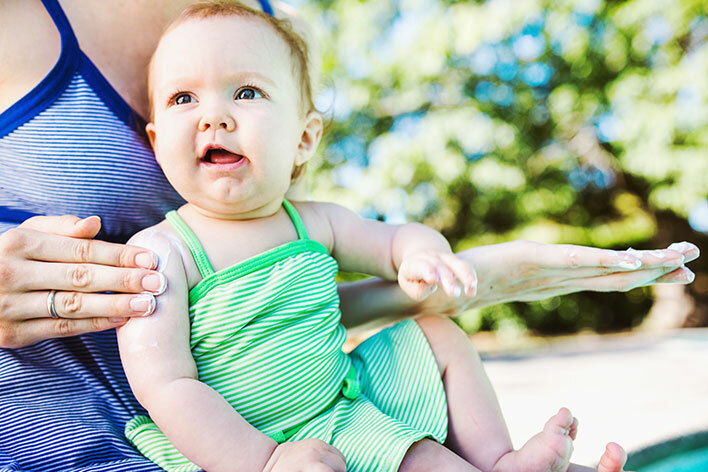 Robin Gehris, MD, of Children’s Dermatology & Acne Treatment Center, said parents who are concerned that clothing and shade aren’t providing enough protection can apply a small amount of sunscreen on exposed areas of their baby’s skin. Parents should only use sunscreens that are “physical blockers,” which contain only zinc oxide or titanium dioxide as the primary ingredients. Dress your baby in lightweight, long-sleeved outfits with pants to shield them from the sun’s harmful rays. Complete the outfit with a hat that shades the full head, ears, and back of the neck. With that in mind, make sure your baby is kept cool. It’s easy for babies to overheat — they aren’t able to cool themselves by sweating, after all. Provide them with plenty of formula or breast milk, and take them inside if they seem dehydrated, fussy, or if you notice a reddening of the skin. Keep a careful eye on your baby at all times. Even in the shade, sun can reflect off metal strollers and other surfaces. Learn more about breastfeeding your baby during the summer. Use sunscreen liberally when your child is old enough. Make sure to cover any exposed skin with sunscreen — don’t forget to cover ears and scalp. Apply sunscreen 15 minutes before sun exposure. Remember to reapply every two hours or more often if you are swimming. Use a sunscreen that is at least SPF 15. Keep in mind that higher SPFs provide more protection. Sunscreen for babies comes in many formulations including gels, creams, and wipes. Don’t use sunscreen sprays, as these can be ingested. Try to use a “broad spectrum” sunscreen. These block both UVA (rays that age the skin) and UVB (rays that burn the skin). Avoid sunscreen with fragrances, as well as sunscreens that contain avobenzone or oxybenzone, which are chemical blockers. Check out our infographic to learn more about Sunscreen 101. Older babies and children should also wear protective clothing in the sun. Clothing that has a tight weave (not sheer) provides the best protection from the sun’s harmful rays. A hat and sunglasses are also recommended if your baby can tolerate them. This provides coverage for the head, face, ears, and eyes. For all ages, try to time your outings to avoid being in the direct sun between the hours of 10 a.m. and 2 p.m., when the sun’s rays are most intense. Skin cancer (melanoma) is the most common cancer in the United States. And this makes sun protection for babies and toddlers critical — it can help prevent long-term skin damage and serious illness.